improvement in the October home building index, offsetting the weak September industrial production index. After the bell, IBM and Apple reported earnings that topped estimates. Some key economic and corporate results scheduled to be released tonight are Bank of America, Johnson and Johnson, Goldman Sachs and Oct housing starts. Despite the ongoing foreclosure concern and mixed economic indicators, the Dow is still able to hold above the up-trend-line UTL since hitting its 3M trough of 9937 points on 27 August, amid positive expectations of a strong 3Q2010 results. 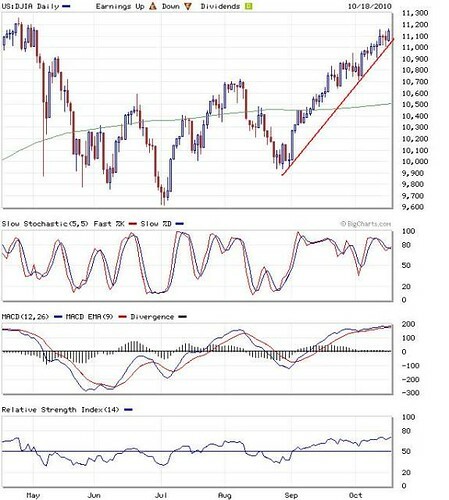 As long as the up-trend-line UTL is not breached, we remain positive on near term Dow Jones outlook despite the overbought technical readings. Immediate resistance level is 52-week high of 11308 while immediate support levels are 11030 (10-d SMA), 10910 (20-d SMA), 10780 (30-d SMA) and 10622 (40-d SMA). Daily DJIA is still holding well above the up trend line UTL.